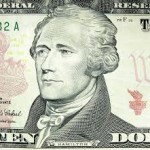 The Friday File: Taking Alexander Hamilton off the $10 bill is a travesty! He consolidated the debts of the states, gave us federalism, wrote most of the Federalist Papers, saved us from a Burr administration, set up a strong federal fiscal infrastructure, founded the country’s first major bank and proto-central bank which was eventually de-chartered by President Jackson. Therefore, honor a deserving woman on the $20 and kick Jackson off.